Well you know what they say… the early bird… catches a good homemade breakfast! We’d been watching the birds in our garden but Minnie wanted a closer look, trouble was she was a little loud as she approached them! So we decided to make some mini bird cakes to hang by our kitchen window to allow Minnie to watch the birds without terrifying them. To make a hole in the yoghurt pot for the string, I pushed a ballpoint pen (you could use a skewer) through the bottom of the pot, with plasticine underneath. We then threaded the string through & tied the lolly stick to one end. A little further up (2 inches) we tied a double knot to stop the string going back through the hole. Then (with Minnie observing & not being hands on at this point) we melted the lard in a large saucepan. Once melted & cooled slightly Minnie added the seeds, nuts & bread to the lard & mixed well. The mixture was then spooned into the yoghurt pots and left to cool for a couple of hours in the fridge. 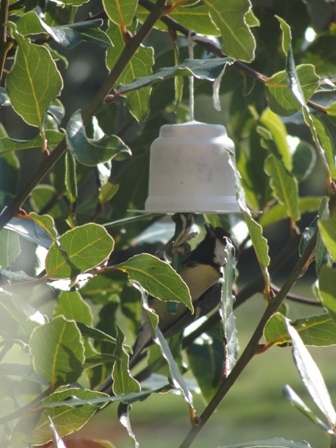 Once the mixture was solid we hung the yoghurt pots upside down (so it looked a little like a bell) around the garden, making sure we had a couple near our kitchen window. The birds clearly enjoyed their tasty treat, & Minnie loved her first experience as an ornithologist !